..in reverse. A leaky back-side! Be careful not to scald your tongue because the cheese is runny and piping hot.. and the tomato base is just as runny. I like the fact that the cone is oozing tomato and cheese. I do not like as much the fact that the cone is rather small .. I could have eaten 3 of these! 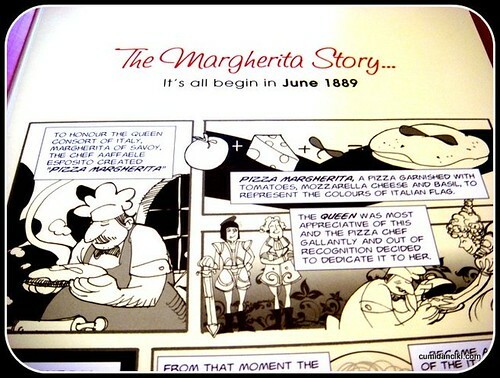 Pizza is probably the most globally recognizable food today, maybe second only to the Big Mac. Me and my colleagues like this place because if you are out in the field, on the go and dining alone, you don’t need to finish an entire pizza on your own. What’s more, you can actually eat more than one type of pizza even if you are dining solo. These pizza cones offer that option. 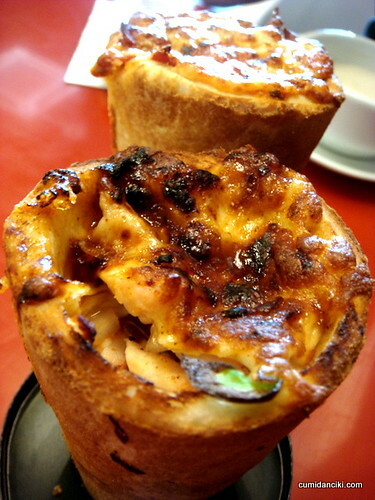 Actually , these cone pizzas have a rather chewy bread like consistency to the dough, that I like. I know it’s all very junk food-ish and all and not terribly gourmet, but sometimes I just like my fast food as it is.. Fast Food! 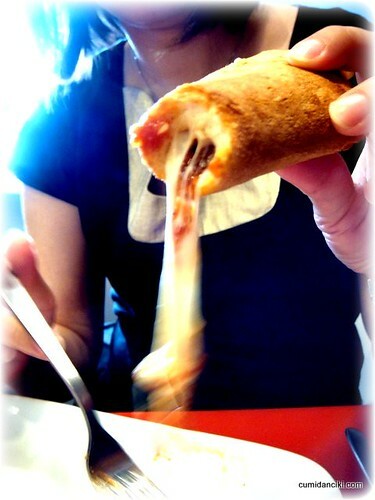 These pizza cones come in all pizza favourites e.g. the Margherita, the Pepperoni, the BBQ Chicken.. etc.. meats, vegetables, cheeses and other ingredients prepared in minutes. The menu is simple enough – they offer cone pizzas, pasta and side dishes such as sandwiches, bruschetta, garlic focaccia, soups and salads. Classic Pepperoni Set with Soup RM15.90; BBQ chicken Set with Fresco Salad RM16.90; and pasta sets for RM7.90 only. Add a dollar to get Ice lemon tea. Weren’t these guys in Pavilion before? 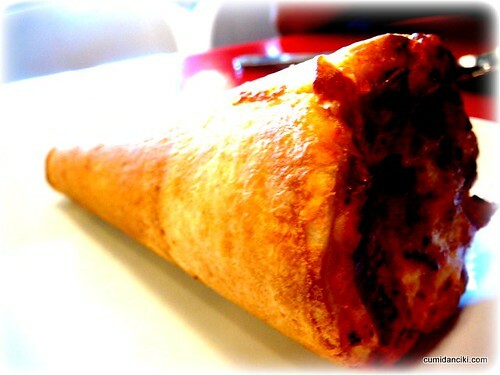 Looks like they ditched the Kono Pizza Franchise in Pavilion KL and came out to recreate their own cone pizza. Quite sad, seen quite a few of this that start out as franchises of the brand, then when things get expensive with the franchise holder, they reopen under another name and start selling the same items from the knowledge they picked up. hi boo! Yar i never tried Kono but this looks just like it. Franchises can get exp to maintain – see how long this can survive. So far, it looks pretty packed with the office crowd. 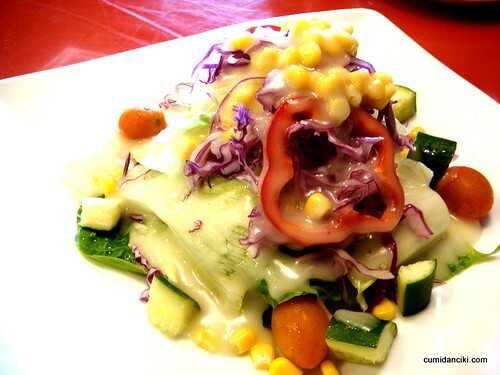 wow look at the cheese… hmm… so sinful! Cone pizza? What will they think of next I wonder…. Im on a soup diet and you eat like this everyday, very jealous! what? soup diet? i hope it’s like a liquid blended bigmac or something.. kidding! soup is good. soup is our friend. cones are cute, but i demand more creativity! gimme pizza pyramids or pizza prisms! yes la sean .. we all know how much excitement you need ..DAILY! I need to start appreciating pizzas…ommmm….pizzas…ommmmm…pizzas…ommmmm…. you don’t like pizza rite? cumi only like FBB’s gourmet pizza.. chis! so spoilt! Yeah, the Kono Pizza looked mighty promising, but didnt really take off. I was not tempted in the 1st place. i stayed in Kota Damansara for 2 years but i didnt know we have that..
is it new there or? its located at the strand. these are the shop lots that face the older dataran sunway. The Kono was expensive, i see tht nw it’s cheaper slightly & more “liew” -the cheese! & also comes in set. first Sri Rampai outlet open, thn Selayang Mall, thn Kota Damansara n last Puchong IOI Boulevard.. but in the end close down is first Selayang Mall, thn Sri Rampai, thn Kota Damansara n last stil alive is in Puchong IOI Boulevard. wat i heard latest news is Puchong IOI Boulevard Italian Cone Pizza will close down soon… might be next year will be close down.. thn in Klang Valley ther is no more Italian Cone Pizza which can b dine in… tats is sad but v stil can go for another pizza industry to enjoy the pizza.